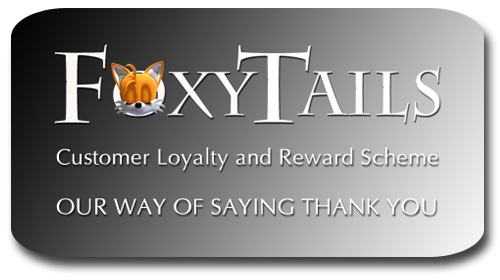 Every time you shop with Foxy-Tails you will earn Loyalty Points at the rate of 1 Loyalty Point for every £2 you spend. The more you spend the more Loyalty Points you will receive. Registering for the scheme is automatic for every customer who holds a personal account. Details of your current Loyalty Point total can be seen when you sign in to your account or enter checkout when making a purchase. The number of Loyalty Points you will receive for each item you purchase is shown on the Product Information Page. Loyalty Points can be spent once you reach the threshold of 25 points or, if you wish to, you can save them until you reach a larger total. Each Loyalty Point is valid for a period of 12-months from the date of award. You can choose to spend Loyalty Points (if you have passed the 25 point threshold) at the checkout where an option will be made available to you. Loyalty Points can only be used to purchase products via the Foxy-Tails (.co.uk) website. If the value of your order exceeds your current Loyalty Point discount you will be able to pay the balance through the standard checkout process. Remember: You need to register for a Foxy-Tails account and be signed in to receive Loyalty Points. We are unable to award Loyalty Points to anyone using a ‘Facebook ID’ or ‘Guest’ sign in option. Loyalty Points are not available to Foxy-Tails appointed Retailers, Wholesalers or Professional Tyers. Loyalty Points are valid for 12-months and are not transferable. Foxy-Tails reserves the right to cancel or amend the Customer Loyalty and Reward Scheme at any time. Loyalty Points have no monetary value and cannot be redeemed for cash or used to purchase Foxy-Tails Gift Vouchers.